An automatic radiosonde homogenisation system that can produce an ensemble of radiosonde temperature datasets based on different methodological decisions has been developed. It uses a neighbour based, iterative approach similar to the manual method employed in HadAT (the Hadley Centre gridded radiosonde temperature product). Each dataset realisation is created by using a different set of system parameter settings to within reasonable bounds. These system settings reflect different plausible assumptions that could be made in the development of a climate quality radiosonde dataset. The results can be used to investigate uncertainties in long term radiosonde observations. This website contains data from a number of system experiments. Results from these experiments are discussed in a number of papers (see references below). 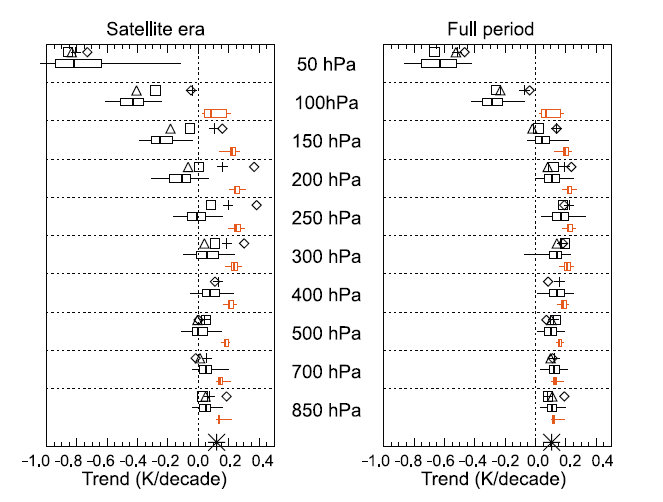 Some experiments were performed on observations of radiosonde temperature anomalies, whereas others were performed using error model data (temperature anomalies from climate model data with known inhomgenieties applied). The later enables validation of the homogenisation system in a realisatic manner. The observational and error model input data are provided, as well as the large scale trends estimated from each experiment. We encourage the use of the error model data to reassess other radiosonde homogenisation systems. Data are available from the download page without charge for the purposes of private study and scientific research, but please read the terms and conditions. You can access the Met Office Customer Centre, any time of the day or night by phone, fax or e-mail. Trained staff will help you find the information or products that are right for you. The figure above has been taken from Thorne et al. (2011). See the paper for more information.